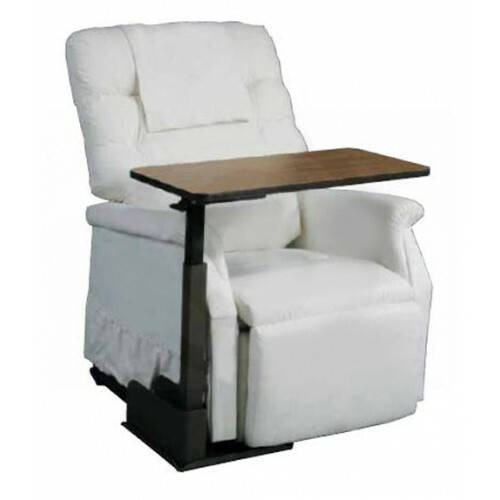 The Drive Medical Seat Lift Chair Table is designed to fit any lift chair, standard recliner, or couch. Table can be ordered in both left or right side varieties, depending on your needs. The chair table can be used for many activities such as eating, writing, crafts, working on the computer, reading, and games. For added convenience, the table top pivots a ful 360 degrees at the touch of a hand. Plus a built-in magazine rack provides added storage and easy use. 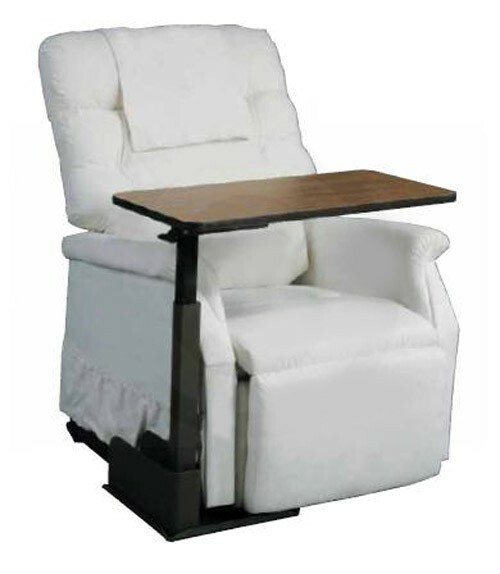 Designed for patients using lift chairs, the table top swivels to allow for easy access and departure. To make sure the table is not too obstrusive or utlitarian, a teak wood grain laminate finish coats the tabletop; making it attractive, easy to clean, and scratch resistant. The Lift Chair table comes with a one year limited warranty. I want you to know that I got 2 tables in error. I ordered one and the one I am returning to you, I was never charged for. I am too honest to keep it and sell it and wanted to return it for a refund. The try did not work in the space where we needed to use it...and now we can not afford to return it because your return policy adds up to almost half of the price of the chair. We will not order from your company again. We can not afford to return the tray because we have to pay a percentage of the original price as well as postage to return it and you will deduct the amount of the "free shipping" from our refund ..all this adds up to almost half of the price of the tray.. so now we are trying to sell it on our own with a smaller loss...we are very disappointed. Unfortunately the tray did not work in the space where we needed to use it ..and now we can not afford to return it since we have to pay a percentage of it's price along with postage and also you will deduct the postage that you paid to send it to us. So now we are trying to sell it on our own .. The tray is OK but your return policy is more then we can afford. The table meets the need for a stable surface to work on while reclining in the lift chair. It is easy for my 91 yr old mother to use . However, the table bast raises one front side of the chair slightly, so we had to put a coaster under the other front side. Not a great solution. Maybe a second plate of the same thickness as the base could be provided? Good Product for Lift Chair Users! Package arrived ahead of expected date. It was easy to assemble, and is very handy in our household. Would recommend it. An adorable gift from mom. My mom lives in a retirement villa. He spoiled herself with things that would make her comfortable, a nice LCD TV, beautiful pieces of furniture and other medical devices that would make her comfortable. One thing I noticed in her house is that she has this chair with table which adjusts according to what she wants. I adore its versatility and I told her how I love it. She then surprised me when she have this thing delivered to my home. She said it is a gift for me. Sweet. I just love this chair. The first thing I do when I get back from work is to take a rest in this chair. What l like the most about it is table. Its size is just perfect for doing ordinary things like having food and doing stuff with your laptop. What's more it pivots 360 degrees! It's just awesome!